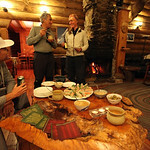 The White Grizzly Lodge is made of local logs, harvested from pine beetle kill-zones, milled by a neighbouring millwright. Much of the buildings are hand-crafted by the owners, Carole and Brad, with the help of their family and friends. 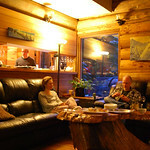 The Lodge is an intimate, quiet, and super comfortable 3200 square foot home-away-from-home. 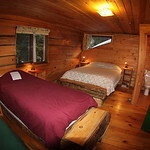 It is nestled in a secluded 10 acre forest of larch, cedar and hemlock, and is accessible by vehicle year-round. The Lodge can accommodate 12 guests, in five comfortable bedrooms, each with en-suite bathrooms and extra long twin, double or queen sized beds. Cat skiing guests and summer guests alike enjoy a massage room, a dry room fully equipped with dry racks and boot-dryers, and a central common area with plush reclining chairs, stretching mats, sound system, big-screen video display system, foosball table and a large stone fireplace. Thanks for all your hard work and improvements. Your operation is so friendly and warm. 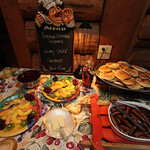 As always the skiing, the food and hospitality were great. Our meals are gourmet and fresh, and hearty enough to satisfy large appetites. We also make a variety of decadent desserts and lunch treats from scratch in our own kitchen. Our chefs are happy to accommodate special dietary requirements, including vegetarian, vegan, gluten/dairy free, or allergies; however, due to our remote location and limited access to grocery stores, we do require notice of any special requests at the time of booking, to allow for menu planning. You may want to make a stop in one of the nearby towns to pick up any spirits or other alcoholic beverages you desire. Our equipment rental shop is fully equipped for maintenance and repairs, and we can help you with adjustments or tune-ups if you require. Our souvenir gift shop includes inner and outerwear, goggles, mitts, mugs, stickers, posters and a variety of local artisan crafts for your perusal. We offer free wi-fi access at the Lodge, but we ask you to be respectful of other guests' need to get away. We also provide a guest phone where you may receive incoming calls, or make calls with a calling card. There is no cell service north of Kaslo, or south of Revelstoke, so be prepared! 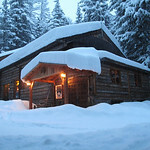 Nous avons passé 4 jours parfaits avec une neige de rêve – le chalet est joli et comfortable, la cuisine delicieuse et le plus important: Carole et Brad nous ont accueillis très amicalement et les guides sont très attentionés (merci special à mon "ange gardien" Stephan).